I have been using pomegranate balsamic vinegar until this weekend when I ran out of it. Now, I had a conundrum to solve. Should I run to the store to get a new bottle or make my own? “Make my own” won the imaginary coin toss, so, I went to my fridge to find the ingredients. Shockingly (read that with a heavy sarcasm in your tone), I had no pomegranate anywhere in my fridge because it is not pom season here in Florida. What I had were strawberries left over from my Strawberry Cupcakes recipe where they were used as garnish. 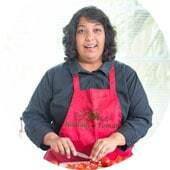 If You you were in my kitchen at that moment, you would have seen a light bulb appear over my head when I saw the strawberries. 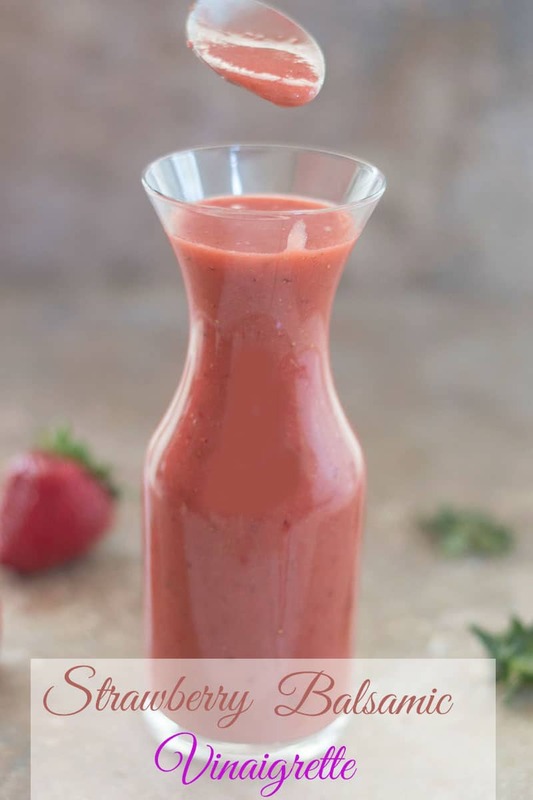 Why not make a strawberry balsamic vinaigrette? How hard can it be, right? Turns out that it was even easier than I thought. All I needed were 4 ingredients to come up with vinaigrette. In 5 minutes, I had my strawberry balsamic vinaigrette which I used in my spinach salad on a bagel and chomped it up! Fruit dressings are nothing new on my blog. My blueberry vinaigrette is a very easy and delicious salad dressing. A perennial favorite is this orange dressing with star anise. My next experiment is with a pomegranate. Stay tuned…. What is your favorite fruit to use in a salad dressing? 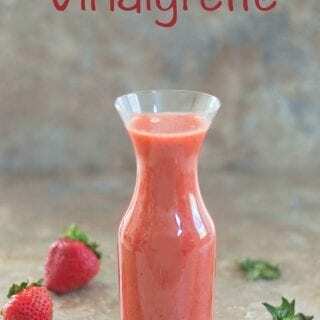 This strawberry balsamic Vinaigrette goes best with a spinach salad. But, you can top it in almost any salad that can handle strawberry flavor. Strawberries also make for a perfect cream cheese dip. It was my favorite from these 5 cream cheese dips. Add balsamic vinegar, maple syrup and olive oil. 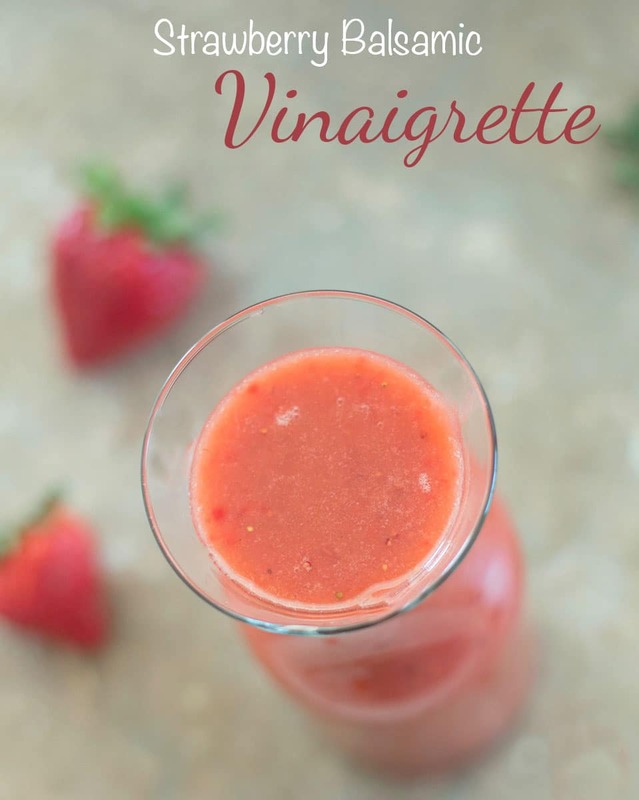 Drizzle the strawberry vinaigrette on a spinach salad for best taste results. 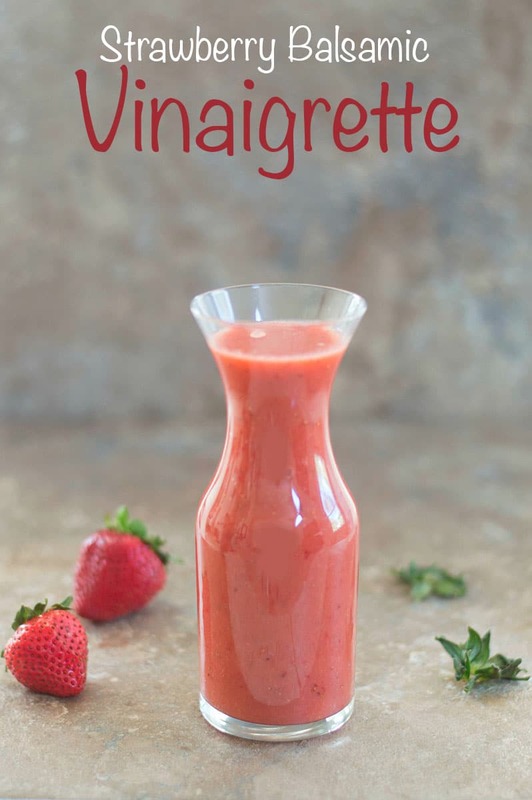 I made this strawberry vinegarette and it is incredible!! Wonderful on salad and even better as a drizzle over roasted chicken and pork! Thank you! Thank you, Nancy. I am so glad to hear that you liked the vinaigrette. It remains one of my all time favorite salad dressings. Your nutritional information says that a serving is 2 cups, but what would it be for 2 tablespoons which is a typical serving size? Can’t wait to try this! Thank you, Kimberly. It comes out to about 22 calories for 2 Tbsps. I love homemade vinaigrette!! The strawberries take this right over the top – such bright delicious flavor. This would be perfect with any salad!! !